GSFB Network: Second State Network Conference: Success! Second State Network Conference: Success! We were very excited to meet with so many of our partners in one day. 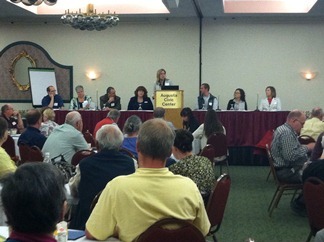 We hope everyone who attended learned a lot, made strategic connections with other agencies, and went home with ideas on how we can work together to end hunger in Maine. If you were unable to attend this year, we do plan to host another event next year around the same time. During the Town Hall session with GSFB staff, we introduced the food bank's Strategic Plan. As promised, we've made the plan available for download on our website. We were also very pleased to award this year's Beacon of Hope Award to Mid Coast Hunger Prevention Program. MCHPP offers a full spectrum of service to meet the diverse needs of their community, including a food pantry, soup kitchen, offering direct delivery to home bound seniors and taking a wholistic approach providing sustainable living education and referral services. Most especially, MCHPP is a leader among peers, hosting the valuable Food Security Coalition of Mid Coast Maine which serves as an opportunity for food pantries in Lincoln and Sagadahoc counties to network, share resources and serve as a forum to address the challenges of hunger as a team.